Ah, candles. I’m crazy about them. They make spaces feel so cozy and inviting. The infatuation began in high school when I discovered Yankee Candles. Their lemon lavender, macintosh, and autumn wreath are old favorites of mine, with mistletoe and november rain being more recent additions to the list. I’m currently burning autumn wreath in my living room and diptyque’s baies in our bedroom. 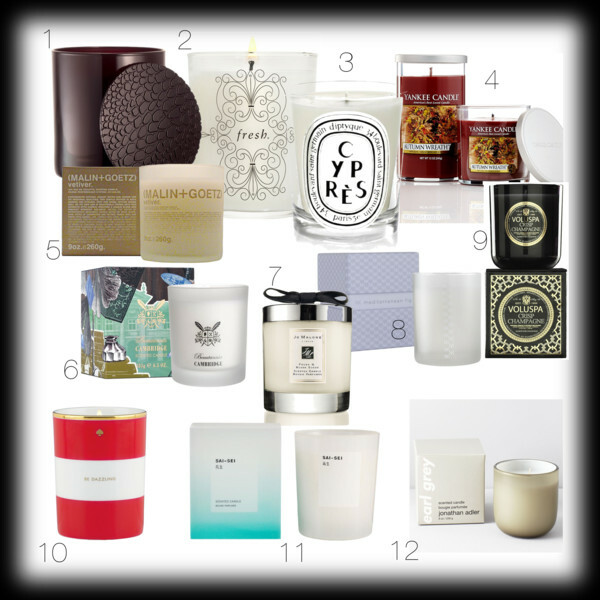 While I prefer my candles to be light and fresh for the spring/summer, I go the exact opposite in the fall/winter when I want all things woody and masculine. I’m eyeing diptyque’s cyprès next. James and I both had a chance to smell it in store, and we both love the woodsy, green scent of it. I’m also intrigued by the Sai-Sei candle. The line’s moisture body cream smells like clean and fresh water, and I’m curious if that’s captured in the candle as well. Any other candles I should have on my radar? p.s. we had a great time in Boston. picture recap coming up. I can already smell some of these, so good. :). Now, which one(s) to pick? Oh yeah Yankee makes some wonderful candles. I share your obsession but think they should always be in jars or containers for safety reasons. Yankee Candles are pretty awesome…I always stock up when they have a sale.